I was going through photo galleries from last night's games and came across some pictures that, while not all that relevant to Icethetics, were pretty funny so I thought I'd share them anyway. This one looks normal enough. Now enlarge the picture and look just above Mike Richards at the woman wearing green. 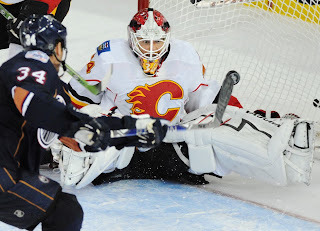 Miikka Kiprusoff appears a little vulnerable. His eyes don't show it. 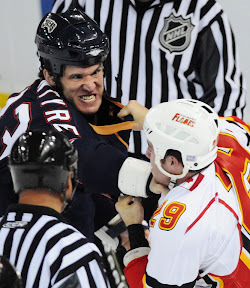 The Oilers' web site credits Steve MacIntyre's fight last night with changing the momentum of the game. I wonder if his facial expression helped at all. I got a kick out of those. Hopefully you did too.